Macs may be all but immune to viruses, but its users are still vulnerable to classic phishing schemes. You may remember that last summer a suspicious e-mail was going around to MobileMe account holders. Made to look like an official communication from Apple, it informed the user that their payment had failed to go through, and linked them to a site where they could fill in their credit card info, which would then of course be used in nefarious ways. Well it looks like this same scheme is going around yet again. 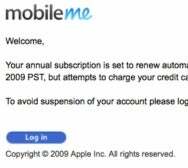 MobileMe users have been receiving a new phishing e-mail that informs them that their annual subscription is set to renew automatically on a certain date, but that "attempts to charge your credit card have failed." It then offers to let you log in to update your information. Once again, we assure you that it's not in the least bit genuine. Let this be a warning to MobileMe users: Never click on links in an email that prompt you to enter your credit card information, and never give your credit card info out unless you're 100 percent sure it's the real deal.